South Korea’s healthcare company Yuhan Corporation signed a deal worth over 878 billion won ($785 million) with US’ Gilead Sciences to jointly develop potential new drugs for the treatment of patients with advanced fibrosis due to nonalcoholic fatty liver disease, the company said Monday. Nonalcoholic steatohepatitis (NASH) is a chronic and progressive liver disease characterized by fat accumulation and inflammation in the liver, which can lead to scarring, or fibrosis, that impairs liver function. Individuals with advanced fibrosis due to NASH, defined as bridging fibrosis or cirrhosis, may face serious consequences, including end-stage liver disease, liver cancer and the need for liver transplantation, and are at a significantly higher risk of liver-related mortality. Existing treatments for NASH patients are limited. Under the new deal, Yuhan and Gilead will jointly carry out preclinical research to discover new drug candidates that can cure NASH patients. 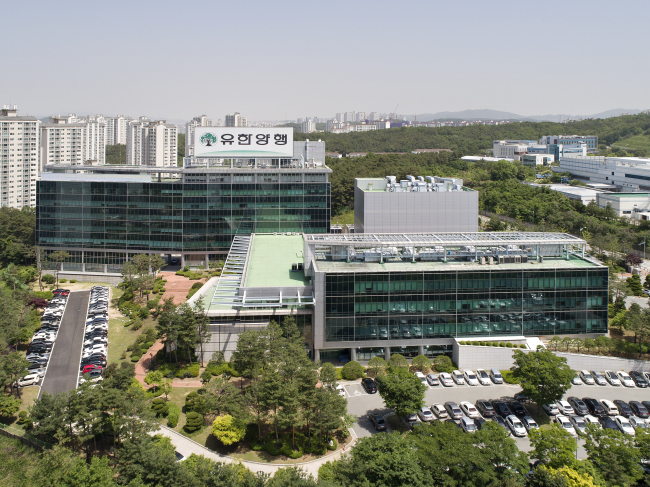 Gilead will be responsible for global clinical development and worldwide commercialization, while Yuhan will be in charge of the affairs in Korea. With this agreement, Yuhan will receive an upfront payment of 16.8 billion won ($15 million) and an additional 861.8 billion won in potential milestone payments upon achievements of certain developments and commercial milestones, as well as royalties on future net sales. Yuhan’s share price surged initially after markets opened Monday, trading up 17.73 percent at 259,000 won as of 9:05 a.m. Most of those gains were lost as the day progressed, with shares up 3.64 percent at 228,000 won at market close. Yuhan is one of the firms invited to present in the three-day J.P. Morgan Healthcare Conference 2019, that took off on Monday in San Francisco, California. In last year’s conference, Yuhan presented its novel clinical-stage therapeutic candidate Lazertinib, used for treatment of patients with non-small cell lung cancer, and later signed a 1.4 trillion won deal with Janssen Biotech in November.